It’s the big kitchens that get the attention. They’re in the movies, the magazines, and running through your dreams. But small kitchens have a lot to offer too. Just think how close everything is when cooking. Small kitchens are often efficient. They get the job done. Making them look stylish isn’t so hard either. 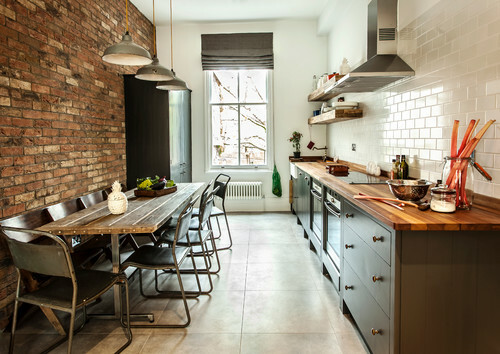 Dark colors in a small space will make the kitchen seem gloomy and cramped. 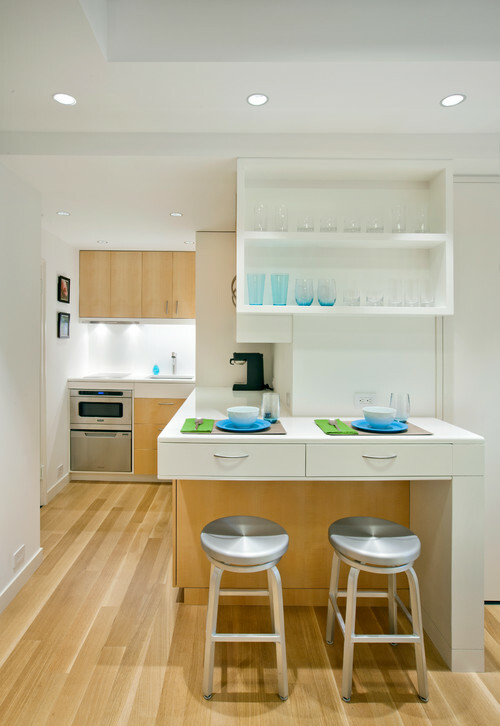 Choose light paint colors, and even light-toned woods for your cabinets, to make your small kitchen inviting. Heavy light fixtures will stop your eye from traveling through the space. 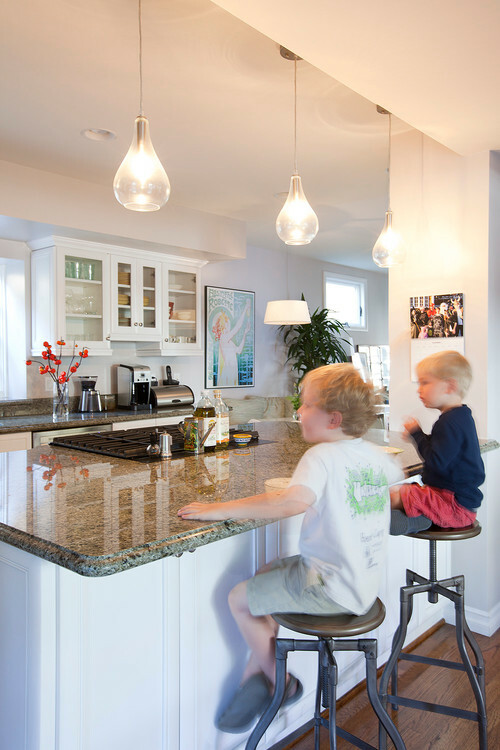 Instead, choose airy light pendants to provide adequate light that’s both stylish and takes up less visual space. In a big kitchen, wasted space isn’t such a big deal. In a small kitchen, where every inch counts, look for areas that aren’t being used. Look for spaces where you can install filler cabinets with sliders. This will get spices or utensils off your counters and tucked out of sight. Look above your cabinets as well. Can you extend your cabinets to the ceiling and give yourself a place to store those small appliances that are only rarely used? It’s not magic; it’s just an illusion. Using large (and light) floor tiles in a small kitchen will make the room seem bigger, airier, and more inviting. 12″ x 12″ is the smallest you should go. Sometimes, upper cabinets make a kitchen feel cramped. 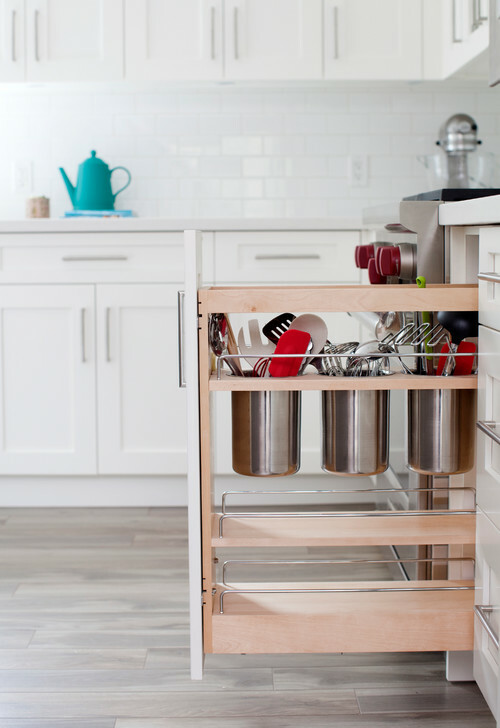 If you can keep open shelves organized, your small kitchen will appear tidy, open, and even bigger. And you won’t bump your head on large cabinets as you move around your kitchen. 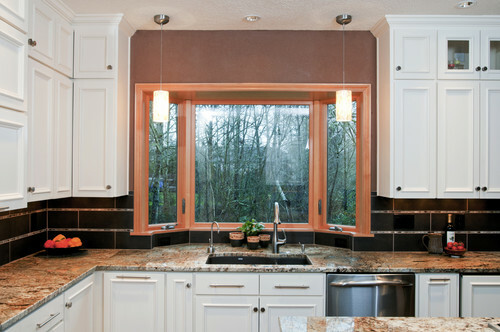 Similar to open shelving, glass-front cabinets visually open up the space in a small kitchen. Because you can see right through them, they give the appearance of more space. Plus, they’re beautiful and stylish (and are a bit more forgiving of occasional disarray than open shelving). A bay window in a small kitchen not only adds charm and style, it also gives you more counter space — and more light. It also breaks up the space, leaving you feeling less cramped. When used right, light instantly opens up a space. Make sure you have enough overhead lighting, but also install lights below both your upper cabinets and your lower cabinets for a sophisticated, open, and put-together look. Using design to visually expand the space works. But you can also embrace the small and choose cozy design elements to make you feel at home and secure in your small space. Think country kitchen or cozy colors. If you enjoy being in the space, it will be just the right size for you. At New Life Bath and Kitchen, we love helping our customers see possibility in their small kitchens. We’ll work with the space you have to help you get the kitchen of your dreams.